The Summer Triangle is high overhead at dusk. This consists of the brightest stars in Cygnus, Lyra, and Aquila. 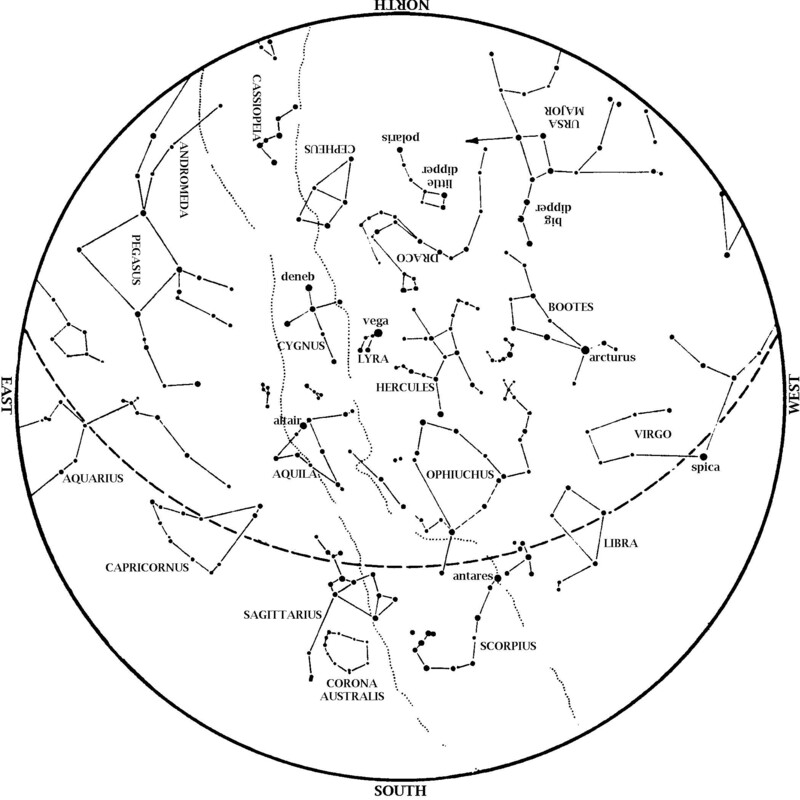 Scorpius, the Scorpion, is in the south, with the ‘teapot’ of Sagittarius to his left. From the Big Dipper’s handle, ‘arc to Arcturus’ and ‘speed on to Spica’ in the southwest. Saturn is between Scorpius and Sagittarius in the south at dusk. The Great Square of Pegasus rises in the east, heralding the coming autumn. Venus remains in the west at dusk this month. Look for it low to the horizon, over the point of sunset. Venus outshines everything in the sky but the Sun and Moon, so you can look for it even in twilight. Venus remains the evening star all spring and summer. Jupiter is still well placed for evening observing, in the south southwest right as night falls. Saturn remains well placed for evening viewing, in the south at dusk, all month. Although significantly dimmer than Mars or Jupiter, Saturn outshines the stars near it, and is therefore just as easy to see. Mars is as bright as it has been since 2003, and it won’t appear any brighter until 2035. Now that we’re past closest approach, Earth has begun to pull ahead of Mars on its faster orbit and leave Mars behind. Thus, Mars is a tad dimmer each night from now on. But the fade out is so gradual that Mars remains spectacular all month; in fact it takes until the end of the year for Mars to fade back to an average brightness. Continue enjoying your views of Mars! In August, face south southwest at dusk. The relation of the phases of the Moon with its revolution around Earth. The sizes of Earth and Moon, and their distance you see here are far from real. On this image the following are also depicted: the synchronous rotation of the Moon, the motion of the Earth around the common center of mass, the difference between the sidereal and synodical month (green mark), the Earth’s axial tilt. Author: Orion 8. Source: Wikimedia Commons. Last Quarter August 4, 1:18 p.m. New August 11, 4:58 a.m.
1st Quarter August 18, 2:49 a Full August 26, 6:56 a.m. 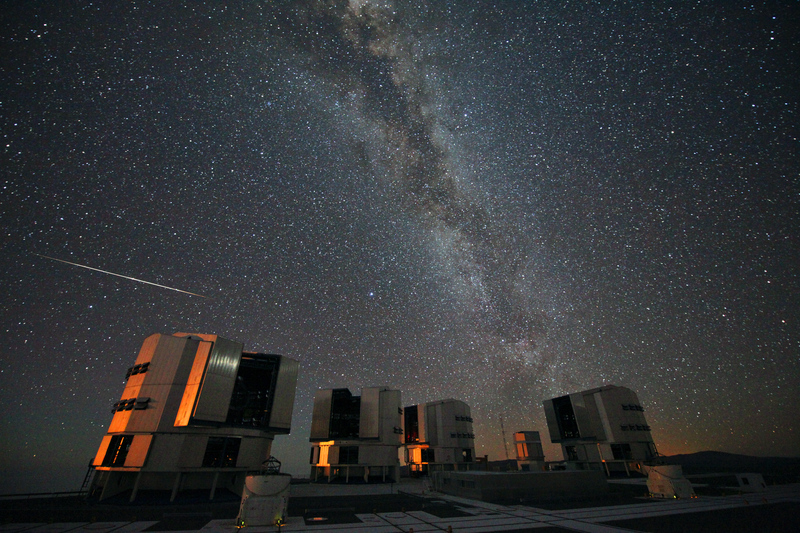 The 2010 Perseids over the ESO’s VLT. Author: ESO/S. Guisard. Source: Wikimedia Commons. The annual Perseid Meteor Shower peaks this year on the night of August 12-13. Note that that is the peak night; some meteors are visible up to two weeks before and after, if not as many as on the peak night. At its best, this shower produces on average one or two meteors per minute. One minute can be a long time if you’re waiting for something to happen. Consider also that this is an average; some minutes may have zero while others have more than two. To see more meteors, keep in mind that the shower gets better as the night wears on, and is best in early morning hours. That’s because Earth is running into the meteors rather than the other way around; the leading edge of the Earth—the side going from night to day—faces into the meteor stream. Also, any bright lights will hide dimmer meteors, so get as far away from the big city as you can for the best view. Our George Observatory will be open Sunday night, August 12, into Monday morning, August 13, for viewing the shower. Excellent post, James – thanks!